Moisture-Loc (formerly Moisturin) protects plants against frost, drought and transplant shock. Moisture-Loc (formerly branded as Moisturin) plant protector is a foliar antitranspirant that forms a strong prophylactic membrane shield on leaves that significantly cuts water loss and lowers plant stress. This formulation is a water-conserving, multi-purpose, clear liquid spray-on plant coating. Water is becoming our most valuable resource, and people everywhere are focusing on water conservation now more than ever. In addition, drought is becoming more common as the effects of climate change increase. Water-conservation management with this product is a great way to prevent loss of moisture—not just in the field, but in transplanting, at harvest, and in storage and shipping. Water-saver products like this also save money, too. Reducing water use means lower irrigation costs. Less irrigation helps lower labor costs. 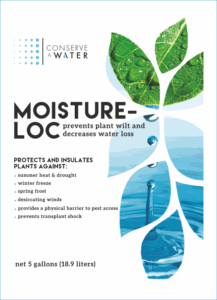 Moisture-Loc’s protection against frost, windburn, pest access, acid rain, salt spray, air pollutants, UV degradation and transplant shock means lower losses, higher profits. Easy to apply—just spray on. Safe – not hazardous to workers who apply the spray. Has no impact on groundwater. Has no impact on soil. Does not negatively affect phytosynthesis or gas transfer. Won’t separate, making it less likely to clog a sprayer. While there are other antitranspirants and antidesiccants on the market, Moisture-Loc excels because its chemistry is completely different from that of other foliar antitranspirants. In its patented formula, the product contains a tough polymer adhesive with a highly efficient rate of vapor transmission. This means that whatever the dilution, this product is non-phytotoxic to plants. Moisture-Loc’s slight gloss coating won’t clog sprayers the way other antitranspirants can. Moisture-Loc’s formula includes a UV inhibitor, two high-grade surfactants and a waterproofing agent to ensure that the film won’t leach off plant surfaces. Moisture-Loc is a highly effective frost protector. Moisture-Loc, as both an antitranspirant AND antidesiccant, cuts water loss in dormant woody plants during harvest, transplanting, shipping and storage. It’ll extend the life and beauty of Christmas trees, too. Moisture-Loc works well for roses, cane-berries, fruit trees and ornamentals. It’s particularly effective at protecting big-leaf evergreens against extreme cold. Moisture-Loc can be applied by all types of sprayers, including backpack and boom and airblast field rigs. Full coverage is important, since most plants transpire on the underside of their leaves. Two separate sprays achieve better coverage than one. A 10:1 dilution is recommended for best results. However, many growers have found that 20:1 dilution works well, and a 50:1 dilution rate can be effective, especially when Moisture-Loc (formerly Moisturin) is used as a spreader-sticker for other neutral Ph-based water-soluble chemicals. Dilution rates above 50:1 are not recommended. Because it is a barrier product, higher dilutions decrease the solids making barrier (coating) products less effective. “Olivi Nursery is a California Nursery specializing in olive trees for landscape and agricultural industries. We provide a myriad of olive trees depending on what fits a project, terrain or landscape criteria. Olivi Nursery ships thousands of young olive trees across the country annually. Our trees are sprayed with Moisture-Loc (formerly Moisturin) prior to transport. Looking for the Moisture-Loc SDS (Safety Data Sheet) or Label? Moisture-Loc is a polymer-based product. If it dries on surfaces not intended, we recommended RPM Technology’s eOx AC for removal. Please see link below.